• Noni offers a gamut of healthful vitamins, minerals and other phytonutrients to improve the body’s overall functioning. 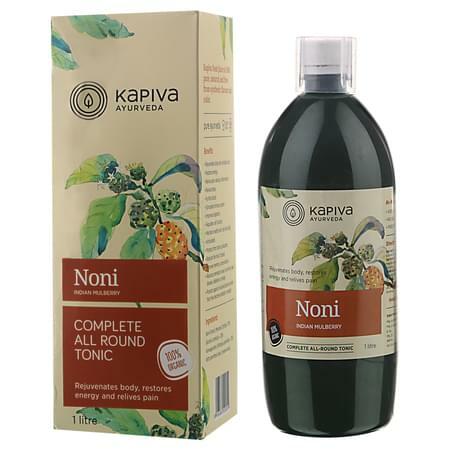 • Each bottle of Kapiva’s Noni Juice has condensed the purest form of noni. • Rejuvenates the body by revitalising the cells, thereby improving every unit’s performance. • Restores energy. • Relieves pain accumulated due to stress and anxiety. • Improves memory, concentration and focus. • Regular use of this juice reduces inflammation, purifies the bloodstream and stimulates the immune system. • Helps maintain healthy skin, scalp and hair. • Consuming 5 to 10ml of this juice with equal parts of water twice a day has numerous and immediate benefits for the human body. • Kapiva derives its name from the three doshas of ayurveda – Kapha-Pitta-Vatta. our range of 200+ GMP Certified products have the right herbs in the right dosage and provide solutions to a variety of ailments. It's the day and age of hybrids, so go ahead and enjoy the best of both worlds - Ayurvedic tradition + Modern-day science and technology.